Authenticity of Statements; Mathnavi; Quranic quotations; Marriage Prayer; 'Sun' and 'Moon'; Hands of the Cause; Night of Power; Khatt-i-Badi; Sarcophagus for Baha'u'llah; International Baha'i Library Building; Lunar Calendar and Holy Days; Leiden; Kings. Originally mirrored with permission from sites.google.com/site/akbweb. At the instruction of the Universal House of Justice, the Research Department has considered the questions about many aspects of the Bahá'í Teachings raised by Mr. ... in his 3 June 1997 letter and its multiple enclosures. We provide the following response. The attached materials referred to in items 1, 6, 7 and 8 have been read and noted. The passage sometimes attributed to 'Abdu'l-Bahá which begins, 'Yá Bahá'u'l-Abhá! In this cry, all the cries of the universe are sounded...' cannot be considered authentic. The Research Department has been unable to find, either in English or in Persian, such a statement attributed to 'Abdu'l-Bahá. An English translation of the first sentence of the prayer submitted by Mr. ... is published in the United States Bahá'í News, May 1973, no. 506, p. 14. 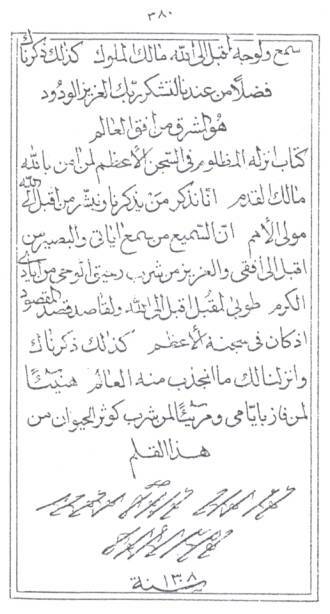 As to its authenticity, the opening phrases of this prayer are found in a very long prayer, revealed in Arabic, which is published in Min Makátíb 'Abdu'l-Bahá (Rio de Janeiro: Editora Bahá'í Brasil, 1982), vol. 1, pp. 9-12. However, the remainder of the English translation, starting with 'that we may be guided', is not contained in that prayer, and the Research Department has not been able to locate an original text which could have been used for that translation. Therefore, aside from the opening phrases, the validity of this prayer is questionable. No authorized translation of this prayer has been issued. A provisional translation of this prayer was provided a few years ago for a member of the Bahá'í World Centre staff, who was told that he could share it with friends and that it could be used pending the publication of an authorized translation. We show the provisional translation below. Thou seest me detached from everything save Thee and clinging to Thee. Guide me then in my doings in a manner which profiteth me for the glory of Thy Cause and the loftiness of the state of Thy servants. This prayer was revealed by the Blessed Beauty for Jináb-i-Samandar [Shaykh Kázim Samandar], the father of the Hand of the Cause of God Tarázu'lláh Samandarí, to assist him in making a difficult decision. The prayer was to be recited nineteen times, followed by meditation on the problem, the formulation of a solution, and the implementation of the conceived solution. We are instructed to say that this is not a Tablet, but an unauthenticated record by Ahmad Sohrab of a talk by 'Abdu'l-Bahá. The friends may use it, but it should be made clear that this is not Scripture and it should not be printed in a compilation of prayers and Tablets. This quotation is taken from an excerpt from the Diary of Mirzá Ahmad Sohrab which was published in 'Star of the West', vol. IX, No. 3, p.39. It is not an authentic text, but is to be regarded as a pilgrim's note. With regard to the correct transliteration and the meaning of the song quoted by Mr. ..., it is suggested that his request be directed to one of the knowledgeable Persian believers residing in the ... community. The drawing is substantially correct. The table prepared by Mr. ... of the first Kull-i-Shay' was perused. The literal meaning of 'Kull-i-Shay' is 'all things'. It does not include among its meanings 'for the sake of God'. Reference is made to the fact that Bahá'u'lláh and 'Abdu'l-Bahá quote from the 'Mathnaví' of Rúmí in Their Writings. Mr. ... mentions that he has purchased R.A. Nicholson's translation of this work and requests assistance in locating the sources of the passages cited in the Writings. We regret that we do not have a list of such sources but suggest he might find it helpful to seek the assistance of one of the Persian friends in identifying the means to pursue his research. Likewise, the Research Department does not have a list of the many quotations from the Qur'án that are to be found in the Epistle to the Son of the Wolf and Paris Talks.3 Again, we suggest that Mr. ... consult with a knowledgeable Persian believer who can help him to get started with this project. Should he, in the future, still be unable to identify some of the Quranic verses, he might wish to enquire of the Research Department. For his interest, we attach a compilation by Burl Barer entitled 'Selections from the Holy Qur'án: Translations and Emendations by Shoghi Effendi', which is published as an appendix in James Heggie's Bahá'í References to Judaism, Christianity and Islam (Oxford: George Ronald, 1986). Mr. ... quotes the above-mentioned prayer which is included in an album of Bahá'í songs. He enquires about the translation of the prayer, where it is published and whether the information about it contained in MacEoin's Rituals in Babism and Bahá'ísm (p. 123) is accurate. No authorized translation of the prayer is currently available. The version cited by Mr. ... represents an early translation. With the exception of the last sentence, the prayer was published in Bahá'í Scriptures, Horace Holley, comp. (New York: Brentano's, 1923), p. 186, and in a prayer book compiled at the request of the National Spiritual Assembly of the United States and Canada, entitled Prayers and Meditations (New York City: Bahá'í Publishing Committee, 1929), p. 12. The information in MacEoin's book is accurate. The information provided in Rituals in Babism and Bahá'ísm concerning the daily recitation of Qur'án 65:2-3 is accurate.5 To date, the particular Tablet has not been translated into English. Mr. ... is free to choose which translation of the Qur'án he uses. In relation to questions 13 and 14, we wish to note that in the Writings of Bahá'u'lláh and 'Abdu'l-Bahá, there are numerous examples of Their recommending to the friends that certain prayers and verses be recited at a certain time of day or a certain number of times. It is the view of the Research Department that, unless specified, such recommendations do not necessarily represent injunctions binding on all the friends. As to interpretations in the Bahá'í Writings of the Quranic verse cited in a Bahá'í marriage prayer, the verse in question is taken from the 55th chapter of the Qur'án, called 'The Merciful'. 'Abdu'l-Bahá's prayer for marriage may itself be considered an elucidation of the Quranic verse. Used in this context the verse seems to suggest that although the two people — 'two seas' — are joined in matrimony, they do not merge together as they are two distinct human souls. It is interesting to note that in other Tablets 'Abdu'l-Bahá gives different interpretations of the same verse. In one He likens the two seas to the material and spiritual worlds, with man and his rational soul like an interface between the two entities. In another Tablet 'Abdu'l-Bahá gives the allegory of the two worlds of light and darkness, of truth and of error, of guidance and of perdition, to signify the two seas referred to in this verse of the Qur'án. Mr. ... observes that, throughout the passage that follows, Bahá'u'lláh refers to and interprets a number of traditions. In each instance He links the terms 'sun' with 'fasting' and 'moon' with 'prayer'. This differs from the sentence cited above. He, therefore, wishes to know whether, in this sentence, the terms might have been reversed. The Persian text of the sentence was studied and it was learned that, in the original language, the word 'fasting' precedes the word 'prayer'. Hence the pattern is uniform throughout. However, it should also be noted that Shoghi Effendi translated the text and his choice of wording may well reflect stylistic considerations. The most complete listing of the Hands of the Cause is contained in The Ministry of the Custodians, 1957-1963: An Account of the Stewardship of the Hands of the Cause (Haifa: Bahá'í World Centre, 1992), pp. xxii-xxiv. This list includes 50 names. Reference is made to 'a Bahá'í book about the Qur'án, possibly Proofs from the Holy Qur'án, where the Quranic 'Night of Power' is discussed.7 Mr. ... wishes to know whether the interpretation provided in this work is correct. A discussion of this subject under the heading, 'The Night which is better than [a] Thousand Months', is contained in Proofs from the Holy Qur'án, pp. 145-146. A careful reading of this section will show that the author states that he is expressing his own view. The Research Department has not been able to locate any authoritative interpretation of this Quranic verse in the Bahá'í Writings. Mr. ... should reach his own understanding of the matter. Mr. ... asks a number of questions about the new language (and script) 'Khatt-i-Badí', mentioned in 'Christopher Buck's book on the 'Kitáb-i-Iqán', and in the 'Epistle to the Son of the Wolf'. He wishes to know who created this language, why it was never used and whether any printed example of it exists. Khatt-i-Badí' was a new script devised by Mírzá Muhammad 'Alí, half-brother of 'Abdu'l-Bahá and a calligrapher of great renown. We have attached for Mr. ...'s study a sample of this new script which appears on the last page of a collection of Bahá'u'lláh's Tablets published in 1891 (1308 A.H.). Mírzá Muhammad 'Alí calligraphed these Tablets and signed his name at the bottom of the last page using the alphabet of the new script. The Research Department has been unable to find any description of how this alphabet functions. At present, a new language and a new script have been devised. The nature of the new language and of the new script remained concealed and hidden. No seeker was found nor did anyone inquire about them; therefore, He [Bahá'u'lláh] left them undisclosed and undivulged. A new language and a new script were hidden in the treasury of His knowledge. No seeker was found; therefore, they were not disclosed. Information about the sarcophagus for Bahá'u'lláh is to be found in Dr. Giachery's Shoghi Effendi, Recollections.9 Decisions about this alabaster sarcophagus will, at the appropriate time, be taken by the Universal House of Justice. This Library is the central depository of all literature published on the Faith, and is an essential source of information for the institutions of the World Centre on all subjects relating to the Cause of God and the conditions of mankind. In future decades its functions must grow, it will serve as an active centre for knowledge in all fields, and it will become the kernel of great institutions of scientific investigation and discovery. The article 'The International Bahá'í Library', from Vineyard of the Lord, Mount Carmel Bahá'í Projects Update, Kalimát 151 B.E./July 1994 A.D., no. 4, p. 8, indicates that the construction of this institution is not scheduled to be completed by the turn of the century. You have heard correctly that some of the Bahá'í Holy Days (i.e., the birthdays of Bahá'u'lláh and the Báb and the anniversaries of the Declaration and Martyrdom of the Báb) are observed in the Holy Land according to the lunar calendar. The timing of these observances follows a practice that was established at the beginning of the Faith in Iran where, as in other parts of the Middle East, dates were reckoned according to the lunar calendar. With regard to the Four Year Plan goal of translating a new volume of selections from the Writings of Bahá'u'lláh, the work of translation is in progress; however, the selection of materials for inclusion in the volume has not yet been finalized. We attach a summary of the information currently available about the Tablets printed in the section headed 'Excerpts from other Tablets' in Tablets of Bahá'u'lláh Revealed after the Kitáb-i-Aqdas. As to how the Tablets of Bahá'u'lláh, held in the library of the University of Leiden, became part of the collection at that library, the Research Department has no specific information about this matter. We note, however, that Leiden has for many years been an important centre for Islamic studies and publishing. Furthermore, it was a common practice among Orientalists to collect manuscripts and to have them copied by scribes. Many of these manuscripts were either purchased or presented as gifts to the major European libraries. With regard to Mr. ...'s questions about the second Tablet to Sultán 'Abdu'l-Azíz of Turkey, the Súriy-i-Múlúk and the Lawh-i-Sultán, the answers to his queries are to be found in God Passes By, pp. 171-173. Mr. ... asks about the procedures for requesting the services of the Research Department and whether the answering of questions of the kind he raises falls within its functions. The Research Department operates under the direction of the Universal House of Justice. At this time its activities include: support of the legislative function of the Universal House of Justice; implementation of projects designated by the House of Justice; preparation of compilations; and translation, classification and indexing of the Sacred Texts and letters of Shoghi Effendi. Individuals are free to request the service of the Research Department. Such requests should be addressed to the Universal House of Justice. The work of the Department is assigned by the House of Justice. The staff of the Department is small; however, we are happy to endeavour, within the constraints imposed by the pressure of ongoing work, to respond to requests for assistance, as time and other priorities will permit. Finally, it is suggested that, while individuals are free to turn to the Research Department, it is also important not to overlook the fact that, increasingly, there are many knowledgeable believers within the local and national Bahá'í communities. These friends represent an invaluable resource and a repository of knowledge and experience on which fellow researchers might draw for information and guidance. 1. We note that there are two items that are numbered '13'. 2. Gleanings from the Writings of Bahá'u'lláh (Wilmette: Bahá'í Publishing Trust, 1983). 3. Epistle to the Son of the Wolf (Wilmette: Bahá'í Publishing Trust, 1988); Paris Talks: Addresses given by 'Abdu'l-Bahá in Paris in 1911-1912 (London: Bahá'í Publishing Trust, 1995). 4. Denis MacEoin, Rituals in Babism and Bahá'ísm (London: British Academic Press, 1994). 6. The Kitáb-i-Iqán (Wilmette: Bahá'í Publishing Trust, 1983), p. 39. 7. Sábir Afáqí, Proofs from the Holy Qur'án (Regarding the Advent of Bahá'u'lláh) (New Delhi: Mir'át Publications, 1993). 8. Epistle to the Son of the Wolf (Wilmette: Bahá'í Publishing Trust, 1988), page 138. 9. Ugo Giachery, Shoghi Effendi , Recollections (Oxford: George Ronald, 1973). See page 137. 10. The Kitáb-i-Aqdas: The Most Holy Book (Wilmette: Bahá'í Publishing Trust, 1993), page 179. 1. The ten extracts published in these pages are taken from one document addressed to Hájí Mírzá Haydar-'Alí, even though some sections within the document clearly are revealed for other believers. A compilation by Burl Barer entitled 'Selecions from the Holy Qur'án: Translations and Emendations by Shoghi Effendi', which is published as an appendix in James Heggie's Bahá'í References to Judaism, Christianity and Islam (Oxford: George Ronald, 1986). This compilation has not been reproduced here. Below are added the texts to which some answers are referring to. They are not part of the answer of the Research Department. O Thou by whose Name the sea of joy moveth and the fragrance of happiness is wafted. I ask Thee to show me from the wonders of Thy favor, that which shall brighten my eyes and shall gladden my heart. Verily, Thou art the Giver, the Generous. And for those who fear God, He ever prepares a way out, and He provides for him from sources he never could imagine. And if any one puts his trust in God, sufficient is God for him. For God will surely accomplish His purpose: verily, for all things has God appointed a due proportion.